Imaging protocols vary among institutions, depending up on the availability of imaging modalities, cost effectiveness and expertise. 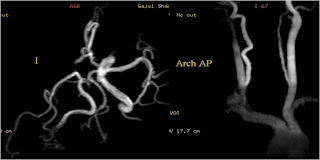 In India at least, availability of imaging modality and affordability of patient are the major issue. And as far as stroke patients are concerned, time is the most important issue. So the to cut short the time required for imaging without compromising the accuracy of diagnosis the protocol we follow in our institution we believe that is simple, less time consuming and applicable to most institutions. 1. To Rule out bleed: Non contrast CT is sufficient to rule out most important infarct mimic that is bleed which is an absolute contraindication for thrombolytic therapy. 3) Reduced parenchymal attenuation with effacement of cortical sulci. 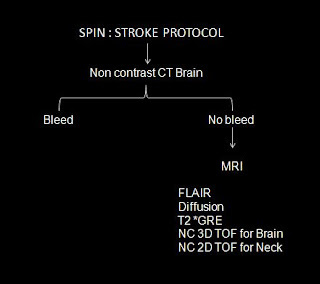 Once bleed is ruled on CT.
MRI is to confirm an infarct with better evaluation. MRI 1.5 tesla GE Signa Excite; basic sequences performed are Ax FLAIR, Diffusion, T2*GRE followed by MR Angiography Brain and NECK. Most sensitive and relatively specific. Based on principle of restriction of normal Brownian motion of water molecules in infarcted tissue. Infarct seen as an abnormal white area and described as an area of restricted diffusion. Sensitivity to pick an infarct is arbitrarily comparable to CT. If an infarct seen on diffusion and not seen FLAIR called FLAIR / Diffusion Mismatch indicate hyper acute infarct - reversible ischemic changes and salvageable tissue or tissue at risk. If changes are marked on FLAIR indicate already infracted and non salvageable tissue. Used to demonstrate hemorrhage or hemorrhagic transformation in the region of infarct as an alternative to CT.
Area of bleed appear dark due to paramagenetic effect of blood degradation products. To demonstrate any major vessel stenosis or occlusion. Case: A 55 yo male, known hypertensive, present with acute onset left side weakness of 5hrs. Clinically there are two possibilities in this case one is hypertensive bleed and second is infarct. On admission CT done first to rule out bleed. 2. Faint low attenuation involving right insular cortex and adjacent basal ganglia - 'insular ribbon' sign. Effacement of right hemispheric cortical sulci. Immediate MRI Brain with MR Angio performed to confirm infarct and better evaluation. MRI Diffusion show an area abnormal restricted diffusion involving right peri sylvian cereberal cortex, adjacent insular cortex and right basal ganglion suggestive of an infarct. Area of involvement corresponds to right MCA proximal main stem territory. Changes are not marked on FLAIR, except a faint hyper intensity is seen implies to Diffusion - FLAIR mismatch goes in favor of a hyper acute to acute infarct. No marked focal cytotoxic odema to cause significant mass effect. 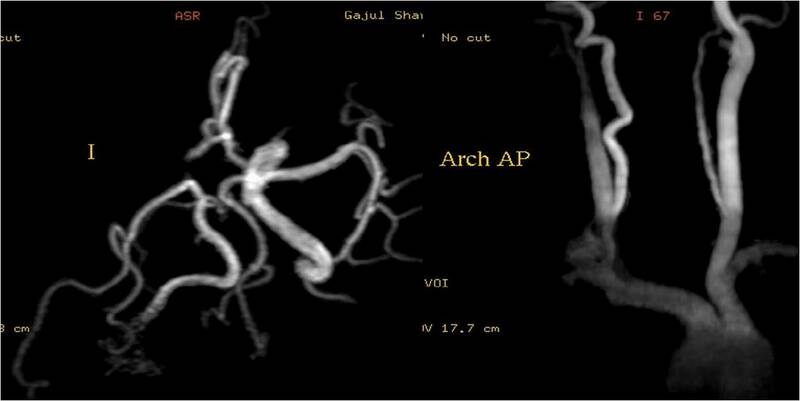 On MR Angiogram right ICA not visualised from its origin and so the right MCA implies to occlusion. Right ACA filled via contra lateral anterior circulation via Acom. T2*GRE omitted in this case as bleed or hemorrhagic transformation is not excepted and we already have done CT for this, this is how u can do minor modifications in protocol and cut short the number of sequences.